Exercise plays an important role in promoting health and well-being for pregnant women. Women who exercise during pregnancy have reduced weight gain, more rapid weight loss after pregnancy, improved mood and improved sleep patterns. Some studies have also shown faster labors and less need for induction with pitocin in women who exercise regularly during pregnancy. Others have demonstrated that women who regularly exercise are less likely to require epidural analgesia and have fewer operative births. Pregnancy is a highly complex physiologic state however, and precautions are needed during pregnancy to ensure that your exercise program does not contribute to complications. In pregnancy the respiratory rate is naturally increased. Because of this, the body works harder to give enough oxygen to the developing fetus. This can reduce the amount of oxygen available for exercise and can cause decreased endurance and a sense of breathlessness. Because of the enlarging womb, the lower back develops more curvature and the center of gravity for your body shifts. This can cause changes in your sense of balance and requires adjustments in posture to prevent injury. Usually women find that they naturally alter their exercise program to accommodate these changes, especially in the last trimester of pregnancy. The joints also undergo changes during pregnancy. Your body releases a hormone called relaxin which loosens up the joints of the pelvis to make room for the birth of your child. Because all of the joints in the body are more lax, there is a greater chance of spraining or straining muscles and joints during pregnancy. During pregnancy your body uses carbohydrates more quickly. Exercise also increases the metabolism of carbohydrates. These two factors can lead to low blood sugar reactions during exercise. Increasing caloric intake to shift your carbohydrate balance is very important for pregnant athletes. Your body increases its blood volume by 40% in pregnancy and your heart rate increases by about 15 beats per minute. This allows nutrients and oxygen to be transported to the fetus more efficiently. However, with the growth of the womb, the flow of blood in the body can be disrupted and light-headedness can occur. While exercising, blood flow shifts away from your internal organs so that your muscles, lungs and heart get a larger share of oxygen. Extreme exercise can cause too large of a shift of oxygen away from the uterus. That’s why reducing the length of time that you exercise strenuously and monitoring your heart rate may prevent problems with your pregnancy. During exercise the brain releases more norepinephrine, a neurotransmitter that can reduce depression and influence blood flow to your heart and kidneys. Norepinephrine also increases smooth muscle contraction and can cause increased uterine activity in the form of painless contractions. 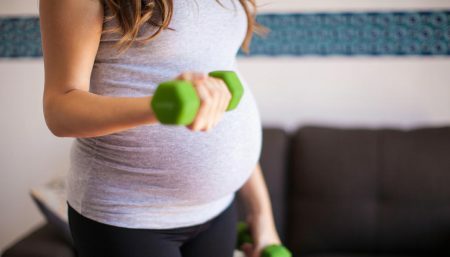 These contractions have not been shown to cause labor, but because of the possible influence on contractions, women who have risks for pre-term labor should be on mild exercise programs. Exercise causes an increase in core body temperature. Some studies have shown that high fevers during the first three months of pregnancy can affect the fetus’s development while other studies have not confirmed these findings. However, women who are extremely fit actually have improved body temperature regulation and have decreased core body temperature during pregnancy. Because of the conflicting data available, general guidelines would include caution when exercising in very hot weather and attention to adequate fluid intake during exercise. Anemia, or a low blood count, results in lower oxygen carrying capacity of your blood. This has a big impact on endurance and may result in a marked decrease in your exercise capability because of breathlessness, dizziness and fatigue. Women with anemia who want to continue their exercise program should eat an iron-rich diet, take extra vitamin C with meals to increase iron absorption and should take iron supplements if prescribed by their maternity care provider. 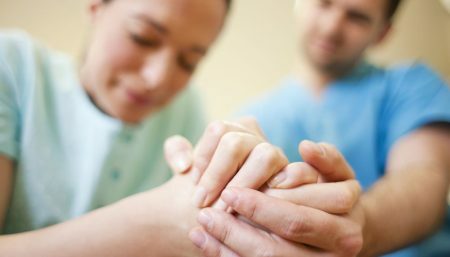 Some women experience pre-term contractions throughout their pregnancy. While pre-term contractions do not always lead to pre-term birth, they do increase a women’s risk of pre-term labor significantly. 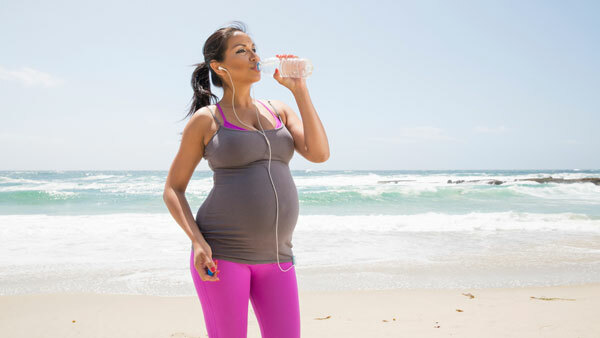 If you have frequent contractions during your pregnancy, strenuous exercise may lead to a higher rate of contractions. Exercise programs should be adjusted to include more non-weight bearing exercise like yoga, stretching and swimming rather than speed-walking or jogging. Many women have episodes of low back pain or leg pain during pregnancy because of weight changes and changes in body posture. Weight-bearing exercise can increase pain levels and further stress the joints. Again, non-weight bearing exercise may help with these symptoms. Swimming is particularly helpful. Placenta Previa is a condition where the placenta grows low in the uterus and actually covers the opening to the cervix. It can cause severe bleeding during pregnancy. Any women with placenta previa or with vaginal bleeding of an unknown cause should not participate in an exercise program. 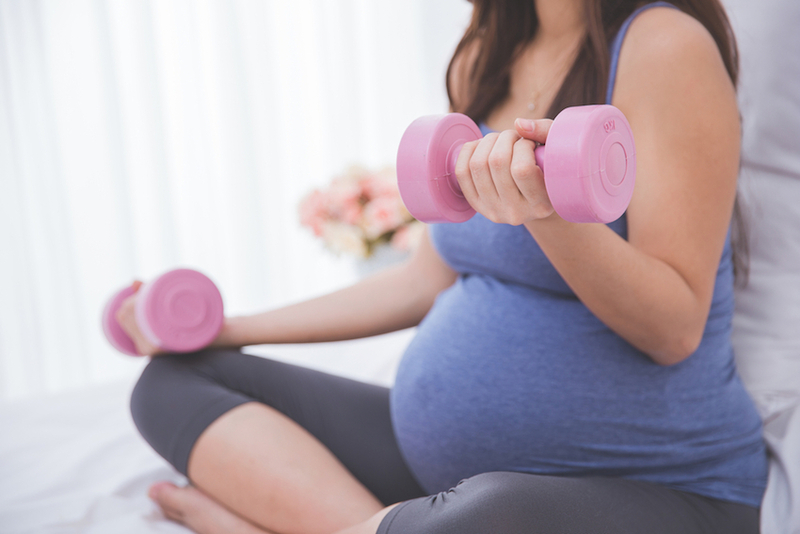 Women who have delivered a baby before 36 weeks of pregnancy should be very cautious in participating in an exercise program during the second and third trimesters of pregnancy. Stretching, yoga and walking are preferred forms of exercise, while weight-bearing exercise should be avoided. Also, women with pre-term contractions should avoid exercise that increases uterine contractions, whether painful or painless. IUGR is poor growth of the baby. This is diagnosed by your maternity care provider by measuring the growth of your uterus and by checking a fetal sonogram. If your baby has IUGR, it may mean that the baby is not getting an adequate oxygen supply from the placenta. There are many causes of IUGR including smoking, drug use, infections and poor blood flow to the placenta. Because exercise shifts blood flow away from the placenta, a baby that is not growing well will not tolerate exercise by it’s mom. Women who are pregnant with more than one fetus have a higher risk of complications or pregnancy including pre-term labor. Exercise should be limited to non-weight bearing and should focus on toning and stretching. Exercise increases the strain on the heart, as does pregnancy because of increased blood volume. Women with heart problems should exercise only under the supervision of their cardiologist and maternity care provider. Contributed by Mara V. Saulitis, M.D.